BETASAB - Become a Sponsor! Sponsor a child today to provide a family, an education, and above all, a bright future! Children need a lot of care; food, shelter, and education are just the start, though. They also need a loving network of support and that's the Global Family Initiative. Your sponsorship provides for the holistic care of a child, with whom you'll form a close bond. Family: GFI sets up permanent family homes because long term stability and a loving network of support is key to success. Each home has no more than 10 children and is headed by two primary care givers (a mother and an auntie). Home: Origins Homes are in a lovely and quiet enclave of Addis Ababa, Lafto, a wonderful place to raise children. They're also integrated into the greater Lafto community, which provides structure and meaning in their lives. The houses are close enough together to allow regular interaction between the children of each of the Betasab Project homes--children get to feel a part of both their smaller family and also the broader Betasab family. Education: Your child attends a local private school in Lafto and receives after-school enrichment activities. Betasab Project children also benefit from a dedicated cadre of volunteers, whose interests are varied and who contribute nicely to the culture of education GFI fosters. Many of our children never attended school before joining the GFI family and now 80% of our children are averaging above a B and several are at the top of their classes. 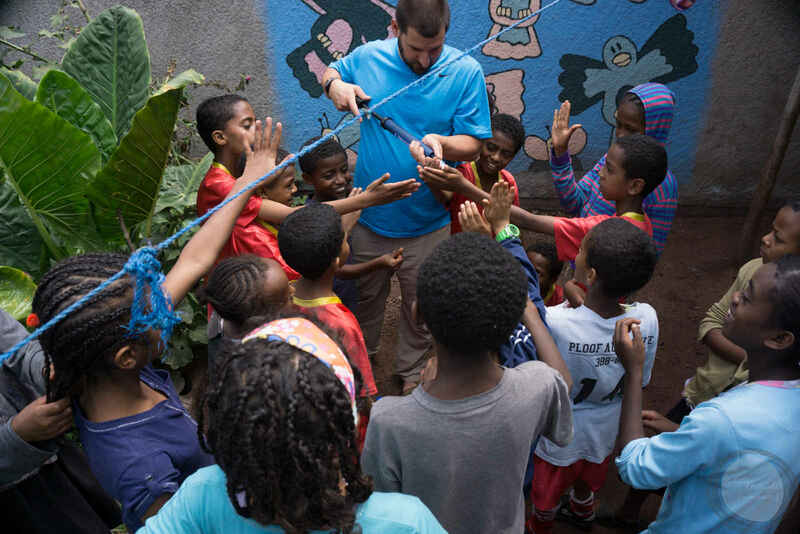 But more importantly, the dedicated Betasab staff in Ethiopia has helped to create a culture of enthusiasm surrounding education that permeates everything. Nutrition: One of the biggest roadblocks to success, especially academic success, is nutrition. Children can't succeed in any respect, but especially in school, when they're hungry. The Betasab Project provides children with the healthy food they need to change the future. Growing children need fuel! Healthcare: Many children in the GFI family didn't have any access to healthcare before joining the family. Now all of our children receive timely and proper care, and our children are happier and healthier than ever! Social and Emotional Well Being: This is perhaps the most difficult to measure, and also likely the most overlooked, of these components. To thrive, we believe children need regular emotional support, and due to the complicated and often devastating circumstances that brought many of the children to the Betasab Project, we have a social worker on staff and regularly work with schools and counselors, as well as volunteers, to provide regular psychosocial support. This is to make sure that no one is left behind or allowed to fall in between the cracks due to trauma or events that took place before joining GFI. Ally Sponsorship of $400/year could feed a child for the year. Humanitarian Sponsorship of $800/year could provide school tuition in addition to food, yearly. Luminary Sponsorship of $1200/year covers about half of the total cost of raising a child and can provide medication, recreation, and a savings account, in addition to education and food. Benefactor Sponsorship of $2,500/year represents the entire program cost per child. In our effort to make sponsorship as widely feasible as possible, we offer a few levels of sponsorship that fall below the actual program cost, divided up on a per child basis. Benefactor Sponsors provide for the entire program, including housing costs and salaries for moms and aunties, knowing that our moms and aunties are being empowered by good jobs and fair pay as well, and that rent is an unfortunate reality and a rising cost in a booming Addis housing market.